It could perhaps be argued that in the promotion of “coaching style” conversations, we have sometimes overlooked the value of mentoring, or at least, not always recognised what it can contribute to an organisation, when properly managed. Combined with the fact that mentoring and coaching have become more and more intertwined in that style of questioning, listening, challenging and the feedback are similar for both. Is it perhaps more about nuance than substance? A mentor will need coaching skills in order to best serve their mentee. Mentors and Coaches have something to learn from each other. It has been argued that in fact mentors do not have any responsibility towards your (the mentee’s) personal development. This suggests that mentoring “is not something that is done to you, but rather something you do for yourself, with the help of other people.” (Doug Stewart TedTalk – June 2016). I would suggest that the same could be said for coaching. Simply being a role model is not sufficient for either a coach or a mentor, because it suggests a passive response to an outside influence, rather than something that “comes from within” and that the mentee or coachee can claim ownership of. If we agree that both coaching and mentoring are about an individual’s development – one distinction might be that while mentoring focuses on the communication of information (tell me all you know), coaching focuses on competencies. 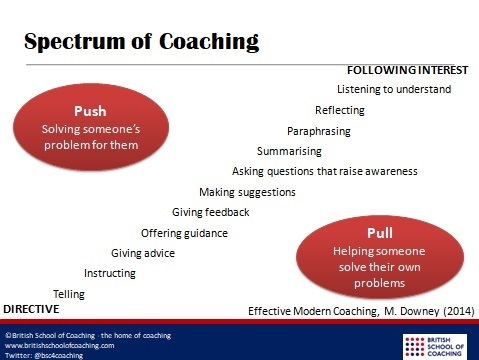 When looked at in the context of the Coaching Spectrum, mentoring sits nearer the “Push” end and coaching nearer the “Pull” one. Myles Downey demonstrates this in his book, see illustration below. “Taking the egg out of an omelette” might be an appropriate metaphor for the relationship between the two so perhaps helpful to look at mentoring in the context of the Coaching Spectrum. If the characteristics of effective coaching sit at the Non-Directive “Pull” Style end of the scale, those for mentoring may sit towards the Directive – “Push” Style end of the scale. What Skills do Both Require? So, what is the difference between Mentoring and Coaching? Both coaching and mentoring are about an individual’s development. It is in the role and the relationship where subtle differences occur. 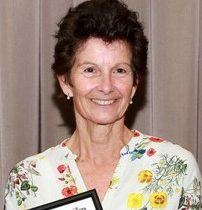 A coaching relationship is built on the premise that both coach and coachee have equal status which has an impact on the type of conversation occurs – the elements of “advice” inherent in a mentoring conversation are not present, and if they do occur, a coach will always seek permission and present suggestions as potential alternatives, rather than as a specific guide to action. This links to the next distinction. Within the mentoring relationship, there is the implicit understanding that there will be a passage of knowledge, and in that this may well be because there is a need to “fill a gap” in the mentees knowledge or understanding. This has an impact on the belief in the power of the individual to find their own solutions, which is a cornerstone of coaching practice. The mentor will be perceived as “adding” something explicitly to the mentee’s knowledge in a way that a coach is not. The element of patronage is a particular characteristic of a mentoring relationship, one that is not generally present in a coaching one. This has been a defining characteristic of mentoring since the ancient Greeks, more often referred to as “sponsorship” in the modern era. It could be argued that while coaching focuses on a particular and specific goal, either personally or professionally, mentoring is more about the development of the mentee in a wider context and over a longer period of time. Because of the longer term, broader themes and whole person focus inherent in a mentoring relationship, there is more opportunity for a less structured framework for conversations. The coffee machine might not be an appropriate place to hold a coaching conversation, but valuable insights can be gained between a mentor and mentee in that environment. Mentoring lends itself more easily to “dipping in and out” or in unscheduled meetings. There is clearly a place for both coaching and mentoring in our present challenging world, as both practices have much to contribute to us professionally and personally.